Vinyl appreciation at its best. 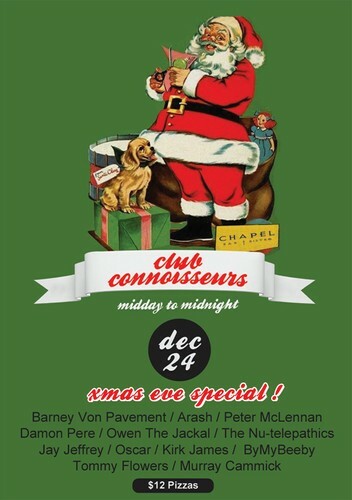 Xmas Eve special! Midday to midnight! Featuring Barney Von Pavement, Arash, Peter McLennan, Damon Pere, Owen the Jackal, The Nu-telepathics, Jay Jeffrey, Oscar, Kirk James, ByMyBeeby, Tommy Flowers and Murray Cammick, plus $12 pizzas.